I didn’t say “I always drink alone.” Maybe I should have quoted Homer Simpson, “Does God count as a person?” But I just explained, “I am meeting people inside.” And I hoped it was true. I stealthily sat at the Irish Craft Brewer Table waiting for The Beer Nut to arrive, drinking the first beer on my list, Thornbridge Craven Silk. It was the second best beer of the day, a perfect summer ale with a strong hop character immediately apparent, giving way to a white grape and floral middle that accumulated with drinking the stuff. I had a third and wished I’d had a pint. It was a lovely sunny color with a lacy head, and perfect study in balancing the delicate and the bold in a light mouthfeel. The Beer Nut and Ms. Beer Nut arrived and the party started in earnest because the rest of the Irish Brew Crew had come with them, including two Americans. Maybe I’m homesick, or maybe these guys were just awesome, but it was great to bond about American beers with other expats. My next beer was the Stone Smoked Porter with Vanilla Bean– The Beer Nut thought it a bit to synthetic, and I saw what he meant. The hops seemed to give the profound vanilla a weird two-dimensionality. The smoke was lost on me. I felt guilty about liking the stuff. It was a vanilla-fairy beer which twinkled along the palate, reminding me of a cereal I ate as a child, something with a prize inside. 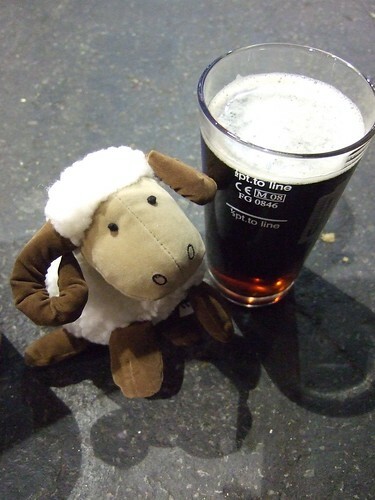 But by this time I was eying Beer Nut’s rather girly looking beer, a cloudy aubergine-colored lambic from De Molen which he described as a farmyard where all the lambs are only fed raspberries. How could I resist? It was in one of those mysterious-looking De Molen casks (you can see them in the video above) which looks just enough like contraband to make you feel like you are getting away with something drinking it. It was indeed the fruit-dream farm beer The Beer Nut had described, and yet there was something dark there as well, a leather note and a bit of tobacco. If I were to extend the metaphor to incorporate these elements that farmyard would be more akin to the Torture Garden. But in a good way. The next beer on my agenda was something that made me think of Jesse Bullington, a medievalist who has written a remarkable novel called The Sad Tale of the Brothers Grossbart. I had the happy chance to hang with him and talk beer last month and I thought it was the kind of beer he would dig. It t urns out it was the most remarkable beer I’ve had this year. The only downside to the gruit was I knew nothing could follow it. But I did try. Beartown Ginger was a thin, dry ginger tea which I couldn’t finish. And next up was the Saint Austell Black Prince which had a mineral tang that predominated and lingered distractedly, like blood in the mouth. Ms. Beer Nut described it, “like licking rocks.” It was swiftly abandoned. 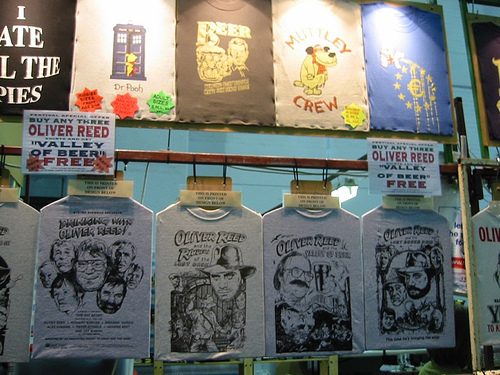 I was on the cusp of feeling a bit morose and hopeless– would I wander around the entire airplane hanger of beer that is the GBBF tasting one unpleasant thing after another? There were suggestions from the table but the last two beers had made me feel a bit queasy, a bit put off beer altogether. Thinking back I should have had some really un-beery beer like another lambic, but instead I opted for the perfectly fine Left Hand Black Jack Porter. Richie suggested I should just have the beer I really liked. It’s what I really wanted, anyway. And honestly, when will I ever see it again? As I got some more I sang its praises to Tandleman who was sceptical, but that’s his MO. Secretly I’d like to think that he stayed on the weird medieval herb beer all night without telling anyone! And then I told Zak about it, though he’d already tried it and wasn’t so keen. I basically talked about it to anyone who would listen. Skinners brewery from Truro were forcing the craic with their marching band headed by a “Queen” in bad drag. huzzah. They thundered through the echoing space like an invading army, and whenever anyone broke a glass the place erupted in hollers as if someone had invented fire. The strange grey space of the Earl’s Court Exhibition Centre is no place to get squiffy. I’ve said it before, but there is a moment in the afternoon when the ugly labyrinth just seems to ambush you. That happened before I had a chance to go up to any of the bars and get the bottles I was hoping to take home. Some in my party were not allowed to take bottled beers from the bar, but Tandleman assured me this was not the case. All the same, I didn’t press my luck. The American bars were so much more crowded than the others, and the layout so confusing– impossible to browse without consulting the maps and program. So I will just have to wonder about the Great Divide 16th Anniversary IPA and the Thornbridge Saint Petersburg and hope that I can get my mitts on a bottle or two elsewhere. And then I sat down and savoured my third, listening to the conversations around me, talking to the American blokes about what it’s like to be here. And I was happy. Sure, the company was great, but I was really, really happy. 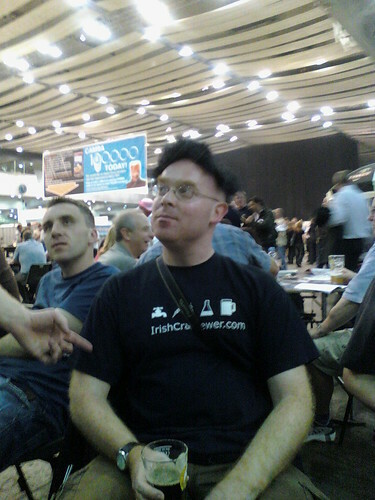 I thought, why is that, when really the GBBF is so often like work– a bit scary, a bit overwhelming, always grim. But I’ve come every year in hopes that I’ll find that elusive thing, that thing every beer-obsessive has felt at one time– beer joy. Last year it was the Allagash Interlude and this year, I found it again in the Solstice Gruit. Thank you, lovely brewers at American Flatbread for making it worth it. 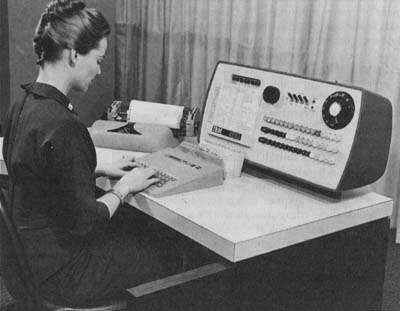 I’ve been up since 5am compiling my list for the Great British Beer Festival. (Did I say yesterday I wasn’t going for the beer? I was lying.) I know this list making is an exercise in futility but I can’t help myself. Have I gone mad or is the GBBF “region” list a complete rewriting of British geography? If you didn’t know the names of the breweries you liked, it would be impossible to find anything. Though organizing 700+ beers can’t be easy, and I won’t pretend I could do it better. I’m keeping my expectations low and realistic, even if I stick to thirds there’s only so much I can drink. There is the dilemma of starting with what is most palate-friendly, but ironically I’ve found at beer festivals there is always a rush on the higher-alcohol brews. Perhaps because they are “rarer”– especially if you do most of your drinking in pubs where most beer available is around 4%. But most of these beers will thrash your palate straight out. But then there is the labyrinth of the GBBF layout to negotiate. Sure, you want to start with that light summer ale with elderflower infusion, but where the hell is it? You get lost and end up drinking some hop bomb which coats your mouth in resins for a good hour. Here is my list for those who really like that kind of thing. You know who you are. Beartown Ginger Bear– (the gay man in me giggles.) I like ginger, I like Beartown and I like ginger bears. Buffy’s Norwich Terrier– I’m a fan of Buffy’s– their Old English Rose was one of those palate-defining brews for me. Though the name isn’t too promising. I keep thinking wet dog. Islay Nerabus–I’m increasingly curious about Scottish brewers, particularly Hebridean ones. This beer also has Amarillo hops, my favourite. Mighty Oak Oscar Wild Mild or Sand Bar– I’ve heard great things about this brewery and it’s local if we’re counting food miles. Orkney Raven Ale– I sampled several beers from this brewery while I was in Orkney. I’ll drink almost anything with “hedgerow” in the tasting notes. St. Austell Prince– I’m a fan of this brewery’s hoppy bitters and am eager to see what they do with a mild. So often breweries will brew a mild for the GBBF but you never see them in pub rotations. It’s a shame– this could be a post in itself. Stone Smoked Porter with Vanilla Bean–I feel obligated to list this as it seems the quintessential beer-chaser type beer: rare, distant and complicated, though I’ve yet to have a Stone beer that has blown me away. Maybe this is the one? Stone This Beer Tastes Better on Tap– this is an in-joke about cask ale, right? Right? If I try it will I be in on the joke? Thornbridge Craven Silk– OK, this is the beer I’m most excited about. Brewed with fresh-picked Elderflower (see, this is why Cyclops style ratings, where beers are broken down into hue, bitterness and sweetness and nothing else, will never really sell beer.) I am hoping to start with this one. Thornbridge Halcyon– after sneaking a sip of Pete Brown‘s at the Jolly Butcher on my Birthday, I need more of this sunny beer. Thornbridge St. Petersburg– there is a pattern forming here! This is my favourite beer style and I can’t wait to see what Thornbridge do with it. I fully expect most of these to be gone or MIA once I get there, but one can hope. Is a blog without updates really a blog? The generous folks at CAMRA seem to think so, and have granted me a pass to the Great British Beer Festival trade session. I wasn’t really sure I wanted to go, especially after hearing Laura and Dave had to give it a miss this year. But then I was lucky enough to meet up with Laura this weekend, as she was visiting for the Knit Nation extravaganza. 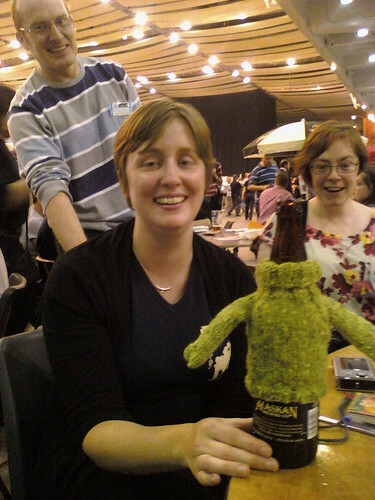 We ended up at the Market Porter fondling roving and wool Laura had found at the knitting event and drinking halves of Harvey’s Bitter and Deeside Talorcan (a hearty, chocolaty stout with an impressive beige head and just enough bitterness and wood notes to really make it complex). We then made our way to the Rake which was more than hospitable. We sampled most of what they had on at the moment, as well as some remarkable bottled ginger beer and the Williams Brothers’ Kelpie which had a warm salinity at the back that was fascinating. We met Nick who’d just come from the Utobeer stall, fully stocked with De Molen bottles. We marvelled at their elegant, mysterious labels in true beer fanatic fashion. Everyone prompted me to get the blog going again, and as you can see they were very persuasive. The only sad news of the day was seeing the landlord of my old local, the Magpie and Crown, pulling pints at the Rake. I asked him what the situation was and he told me he’d been forced out due to excessive rents after running the place for 14 years, offering stellar real ales from local breweries and lovely cider as well as the best Thai food I’ve had in London. This is a common story all over London, another example of greed pushing out places with individual character , history and personal vision. 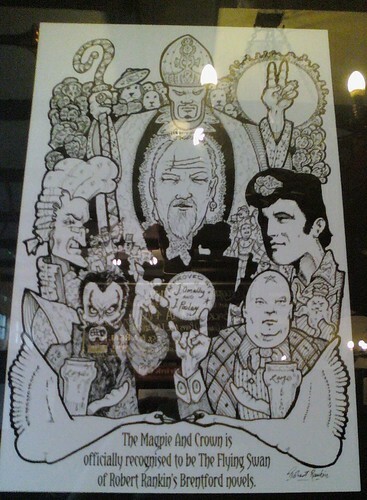 I never really liked living in greater west London, but the Magpie and Crown was one consolation. I relished the notion that I could go down the street and never know what I might try, but knowing there would be something that I was perfectly in the mood for, and the music would be good and at the right volume and the punters just strange enough to be interesting. And, you know, I’d always have the corner seat by the window. 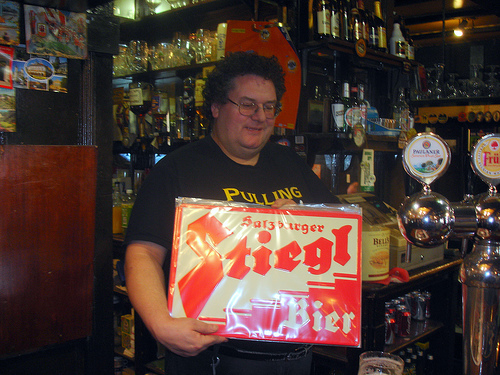 The pub is still there but it won’t be the same without Steve, and I thank him for helping to make the time I lived there much happier, welcoming and full of fantastic beers. So now it’s on to forming my beer festival game plan. Last year I had a list which became useless within minutes as I realized the beers I most wanted to try weren’t there yet or were MIA or were trumped by bigger and better ideas from the beer hounds surrounding me. Which brings me to the real reason I’m going. It isn’t really for the beer at all (don’t tell anyone!) but for the fellow beer writers and brewers– where good beer is you find good people, it’s as simple as that. 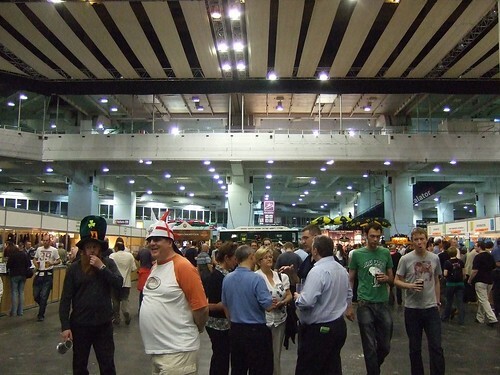 GBBF-- a grim venue in which to get your buzz on. “Why would you need to go to a festival to get beer?” The guy from the mail room, who’d stopped by the new high security den in which I work, asked. My co-worker had just informed him that I was going to the GBBF again, after having gone almost every day this week. They found this hilarious. I told him there were hundreds of beers by small breweries, beers you could never get at your local pub or off license. I have to admit that after three days of drinking countless and varied thirds, I see a sliver of wisdom in this man’s words. You see, I don’t feel so great. Friday night my feet were covered from blisters– after working 8 hours in heels and corporate costume, I now stood for another five drinking. And then I spilled mild all over my only good work skirt, and I wasn’t even drunk. I was in serious beer overload. 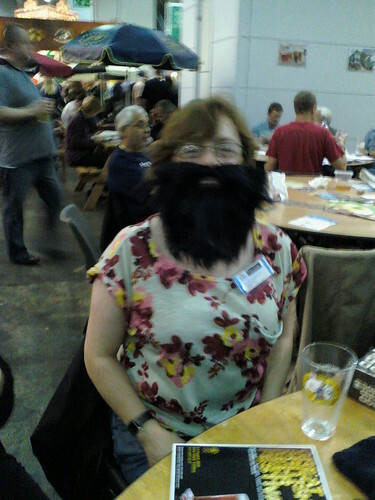 It’s hard to get drunk happily at the GBBF. There’s a lot of trekking around, looking for the beer you want, and then queuing, and then more walking around looking for a small, calm corner in which to enjoy it. You realize there is really no such thing, so you drink it while being jostled by unfriendly crowds. And then with the next 1/3 of a pint it starts all over again. If Tuesday belongs to the professionals, Wednesday belongs to the obsessives, the tickers. Thursday belongs to the suited hedonists: City workers drinking as fast as they can before their 9 o’clock train. And Friday belongs to all the people you’d rather not drink with. Friday is one giant stag night. Groups of men roam, roaring in unison every time a glass breaks or they win at something or just because they think they need to jump-start the craic. They’re wearing purple western hats usually reserved for desperate fun of the hen night, or tams with “ginger” hair attached, or jester hats. And it’s not even hat night. That was Thursday. And there are more women on Friday, but they are tarted up in the tiniest skirts and stilettos. After wringing a half pint of mild from my career-wear separates, I’m really no better. I just wish I was drunk like them and maybe none of it would matter. But the thing I realized as I watched a saintly CAMRA volunteer set up the “roll the barrel” game for the stream of drunk asshats (in America the equivalent would be frat guys, but in the UK I’m not sure) I realized why I came every night wasn’t just for the beer, or the spectacle of machismo, but the sheer wonder of this volunteer-run event. To work unpaid in the dismal Earl’s Court Exhibition Centre with drunks and beer obsessives sounds like its own kind of hell. You’d have to really love beer to do this. I hope they all got lots of it. A lovely CAMRA volunteer encouraged me to try my luck at the tombola– only a pound to play, and you are guaranteed to win! When I won a little stuffed ram toy she whispered, “If you don’t like it you can pick another.” But how could I? I’d already won. Abbeydale Black Mass: a thinner stout, quite hoppy– almost soapy. Anglo-Dutch Brewery, Tabitha the Knackered: a favourite of mine from the festival. Golden amber with an orangeflower water nose. Slyly warming at 6%. Refreshing but complex. Bushy’s Oyster Stout: Another favourite. I would like a glass of this right now please. Very close to Porterhouse’s version, minus the salinity and with more chocolate happening. Dunham Massey, Chocolate Cherry Mild: An amazing beer, exactly like its name except that it’s not too sweet at all, balanced by a gently hoppy finish. I drank a lot of this. Mighty Oak, Oscar Wilde Mild: It was tasty but through a major party foul I ended up wearing most of this. Valhalla, Old Scatness: Named after the Iron Age village in Shetland and brewed from the ancient grain bere, this was really a light but satisfying beer– one which I went back to again and again. While in the Okneys we lived on the local flat bere loaves and the fresh white cheese made at a farm near our cottage. I thought this beer would have gone perfectly with these lunches. It made me long to go back to the Outer Hebrides. Thursday was a blur of ciders– the most memorable was Rathay’s Old Goat with its mossy, forest creature nose and very dry finish. I had several other milds and a few other stouts but I neglected to make note of them.